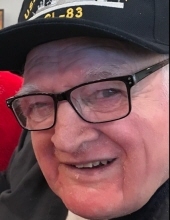 Merlin age 86, loving uncle and friend passed away on February 3, 2019 at the Villa of Rose City. He was born on October 25, 1932 in Fraser Township to the late C. Devoist & Ruth (Scott) Selman. He was a graduate of Pinconning High School Class of 1951. He joined the Navy in May 1952 with an honorable discharge on August 1955. He served during the Korean War on the USS Manchester as a Fireman. Merlin was a member of the FRA #358 serving as a chaplain. He then went back to his favorite place, on the farm with his parents. He loved sports; baseball, basketball and wrestling. There was nothing like the love he had for football. When he wasn’t volunteering at the VA on Friday night, he would be at Pinconning High School football games supporting the Spartans as well as attending away games. He enjoyed visiting with his neighbors, friends and family, he always had something to talk about and share with others. He is survived by a niece, Deborah Kempa, nephew Gary & Sherry Lightner and a great nieces and nephews, Stephanie Ball, Cindy Kempa, Jessica & Clif Holland, Jeremy and Jasun Lightner, Calvin Holland and Emmalee Holland. He was predeceased by a sister Arlene Mattingly in 2013 and his best friend whom was like a brother Larry Wilson in 2015. Funeral Services will be held Saturday, February 9, 2019 at 2 pm from the Lee-Ramsay Funeral Home with Deacon Gary Patelski presiding with military funeral honors with burial in Heavenly Rest Cemetery. Friends may call at the funeral home on Saturday, from 10 am until time of service. The family would like to Thank You to the Villa of Rose City for the compassionate care given to Merlin during his stay. To send flowers or a remembrance gift to the family of Merlin Selman, please visit our Tribute Store. Lauria & Old Kawkawlin Rds. "Email Address" would like to share the life celebration of Merlin Selman. Click on the "link" to go to share a favorite memory or leave a condolence message for the family.